Our advanced systems are very high performance. They are more complex than our minimalist systems, involving at a minimum separate source components and amplification, larger more capable speakers, and other elements that are required to achieve very high performance. 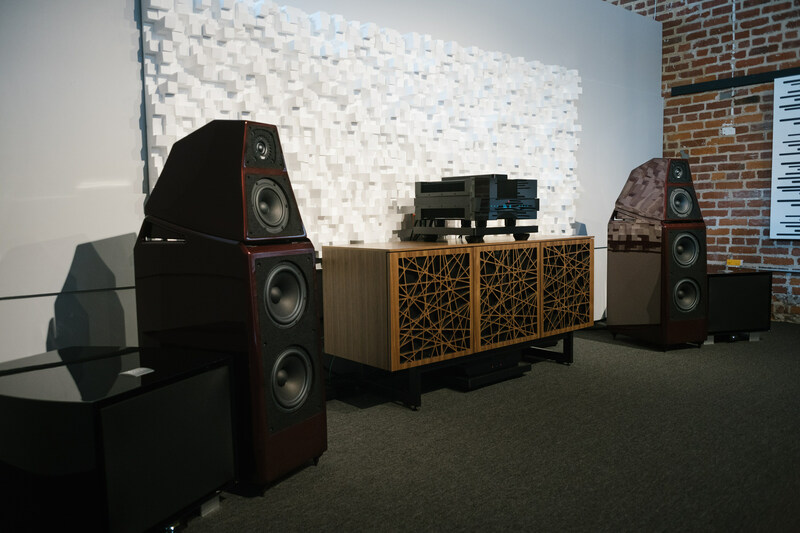 An advanced system is not just a large bunch of boxes, it is a carefully selected, synergistic assemblage of components properly installed that make a music system really sing. Careful setup and most importantly precise speaker placement adjustments are absolutely essential to achieving the performance you paid for. We do it all. You don’t need to be an expert, we are. The price of the system includes delivery, setup and painstaking dial in to make sure you get what you paid for. You paid for performance in your home, not boxes. We have built this ability over our 48 years of dedication to achieving best music reproduction in homes. Such systems have a very wide price range. The one we are showing was intended to give you a good taste of what can be done. It will knock your socks off. Similar systems start at about a third of this $100,000 system and extend to no compromise systems in the Ferrari price range. We have such a system in Omaha. We often put together systems with this concept that are well below these advanced systems in price but can easily build in to them with our no loss Trade Up program. Such systems start at around $15,000 but you can build to them by improving your current system one component at a time. The advance system in our loft is about as simple as it can get for this level of performance involving only two major electronic components. The value in this system is incredible. To go beyond the performance of either the source component or the amplification/control component in performance requires an investment several times the cost of these components. This system shown starts with an Aurender caching network music server/player. Aurender music servers offer best performance and great convenience in music storage and streaming from local and internet sources. The Aurender A10 used in this system is an extraordinary value. This component is $5,500 and contains a DAC (digital to analog converter) as well as the storing server. We will also always show a record player. The models will vary. Turntables are an increasingly sought-after source. We offer turntables/record-players from $400 to $150,000. The amplification is by Gryphon, a 30 year old Danish company that makes one of the most musically accurate amplification systems we have been able to find. In this system we are using the Diablo 300 integrated control amplifier. This amplifier is an astonishing performer, clearly better than amplification systems costing several times it’s $16,000 price. For those of you into specs, this amplifier, weighing in at 85 pounds, is fully balanced, delivers 20 watts per channel in class A and produces 600 watts into a 4 ohm load. It can produce as much as 950 watts when called upon. In Omaha we have Gryphon preamplifiers and amplifiers offering even greater performance. Go HERE to learn more about the Diablo 300 on Gryphon’s website. The speakers are the Wilson Audio Sasha DAW. 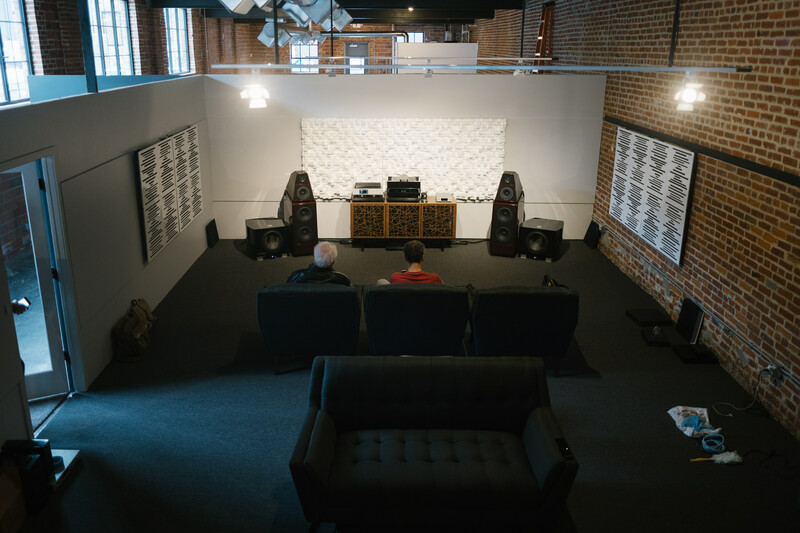 Wilson speakers have been made to the highest standards in Provo Utah for more than 40 years. Company-wide they are committed to making each and every speaker meet those very high standards. No speaker manufacturer in the world has higher standards of production than Wilson. The craftsmen at Wilson are dedicated to making every speaker to their exacting standards. 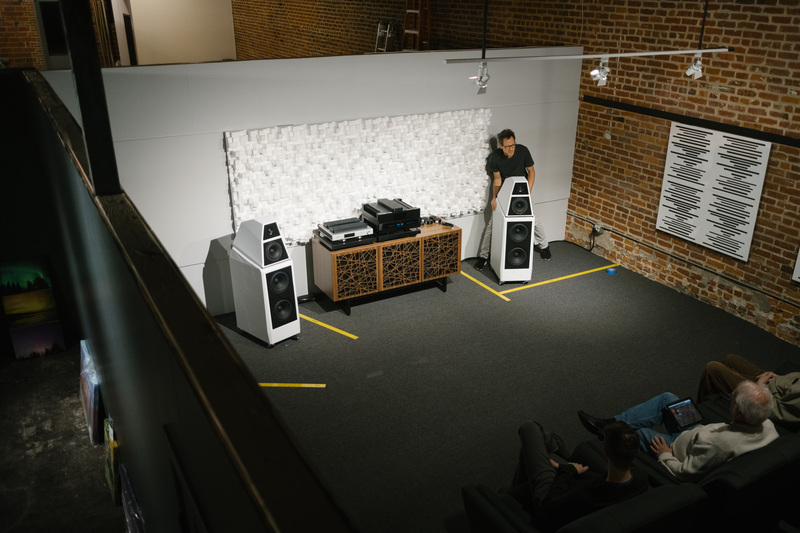 You can be assured that each speaker in a pair is exactly matched to the other speaker and that the next Sasha DAW they make will be identical in performance to the last one they made. This dedication is absolutely essential at this level of performance and price to have real value. Sasha DAW is $37,900 a pair. Wilson speakers have great value at every price. We and our customers expect it. Wilson speakers range in price from $9,800 a pair to $685,000 a pair. Those prices all include precise installation and alignment. To see our tour of the Wilson research and production facility click HERE (Includes lots of photos!). For more information on Wilson visit their website HERE. 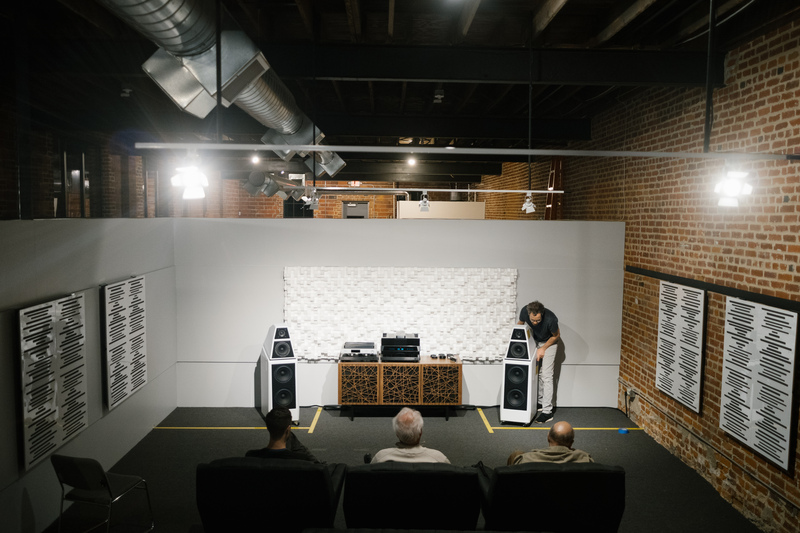 We have five models of Wilson speakers on demonstration in our Omaha showrooms. They range in price from under $10,000 a pair to over $100,000 a pair. The Sasha DAW is shown in our KC showroom in Carmon Red but can be any color you want. As good as Wilson speakers are, they cannot achieve their designed performance without exacting positioning and setup in your room. That service is part of the purchase price of every pair of Wilson speakers. We mean not just delivery and setup but fine tuning the position, height and rake angle to achieve best performance. Every room is different. Our team is experienced in this art. We all know music. We make the system get the music right. It is like learning to play a musical instrument. It takes aptitude and years of practice. Does a speaker at this level require an additional separate woofer? No, but our system includes two of them. Why? The Sasha DAW have excellent bass performance, yet we have found that separate woofers, ideally configured improve the sound of any system. How can this be? What do these woofers do? In a room our size in KC what we have room for does not extend the bass capability of the Sasha DAW to lower frequencies. They do augment the impact of kick drum or concert bass drum and surprisingly they make the all-important mid-range give you a much greater sense of the performers being present in the room. It is an exacting effort to incorporate woofers into this high-level system. Execution is everything. You must start with a woofer with certain capability. The REL woofers we are using have those capabilities, but then comes the art of making it work. We have learned over the years, how to do it. It is like a great conductor getting the musicians in a symphony orchestra not just to play together but to really make music. Our consultants make the woofers integrate seamlessly with the main speakers. They are absolutely not apparent as separate entities. This involves positioning as with the main speakers, adjustment of loudness and pass band, sometimes called crossover frequency. We can give you a quick demonstration of with and without. You will be amazed. Essential components of a very high-performance system are those not seen or not obvious. These hidden but essential components include cables, power conditioning, vibration isolation and true ground provision. These include interconnect and speaker cables. This system, and all of our systems, use what we have found to be the ideal product in this category. They are made in Maine by Transparent. Transparent has been making high performance cables for more than 25 years. They are dedicated to research, making significant improvements in all of their products over the years. They have a trade up program that covers their full range of products. Transparent makes speaker cables ranging in price from $220 a pair to $65,000 a pair. We have them all. For more information click HERE to view Transparent’s website. Transparent does it best. Surge protection is essential to protect your system from power line surges produced by nearby lightning strikes and other power line events. You can acquire some level of protection at very low prices but those devices usually fail after repeated surges and are not terribly effective. Transparent surge protection does not fail and clamps the surges incredibly fast. They also protect the incoming ethernet connection. Most power conditioner’s negatively affect the sound usually by current limiting. Transparent power conditioners do not limit current but do remove nasty higher frequency noise from the system. For more information click HERE. An integral part of power conditioning is using the best power cord. For more information click HERE. Harmonic Resolution Systems (HRS) is a company that specializes in isolation bases, stands, and other devices that reduce vibration from effecting the performance of your system. No high-performance system can perform at its best without HRS isolation. We are one of only a few HRS Platinum level dealers. We use and have on display all HRS stands and other isolation and vibration control devices. Visit the HRS website HERE. Your house electrical system has ground as legally required and protects you from electrical shock hazard. It does not provide a true ground required for elimination of radio frequency noise impinging on the sensitive electronics in your system. Providing true ground is very difficult and expensive and cannot be done at all if you live in a condominium or apartment. The Nordost QKORE ground unit comes to the rescue. No high-performance system can function at its best without a QKORE. Learn more about QKORE. Click HERE. The components in this advanced system are available nowhere else near Kansas City except The Sound Environment in Omaha. Otherwise you would need to travel 500 miles or more to hear any of them and nowhere together.